This training is designed to supercharge your yoga practice and personal development, and prepare you to confidently and intelligently guide others. You will profoundly deepen your yoga practice and your fundamental understanding of classical and modern yoga. Through the study of asana, pranayama, meditation, anatomical alignment and yogic philosophy you will gain a thorough comprehension of the foundational components of teaching vinyasa yoga. Discover a more authentic self-expression, empowered leadership skills, and personal growth. You will leave better able to positively impact your community, and better equipped to live as an example for others, both on and off the mat. 1. Not a yoga studio. We are focused entirely on yoga teacher development and education - no distractions. This singular focus allows us to channel all of our energy and passion toward bringing you the best learning and development experience possible. Become a successful yoga teacher no matter where you decide to teach - we will use our connections and support to help you get there. This is more than lecture. Practice what you learn. Experientially apply your knowledge into live practicum experiences with supportive feedback. Practice teaching skills that make a positive difference in your teaching, so you can make a positive difference for your students. Students report a top benefit of this program is their personal transformative experience. Through the study of yoga philosophy and how to teach, you will foster bold confidence, gain enhanced clarity, and improve the relationship with yourself. Inspire others around you through your conscious way of being and positive presence. Make the impossible possible. One of the best things about yoga teacher training is you get to go through it with other people. 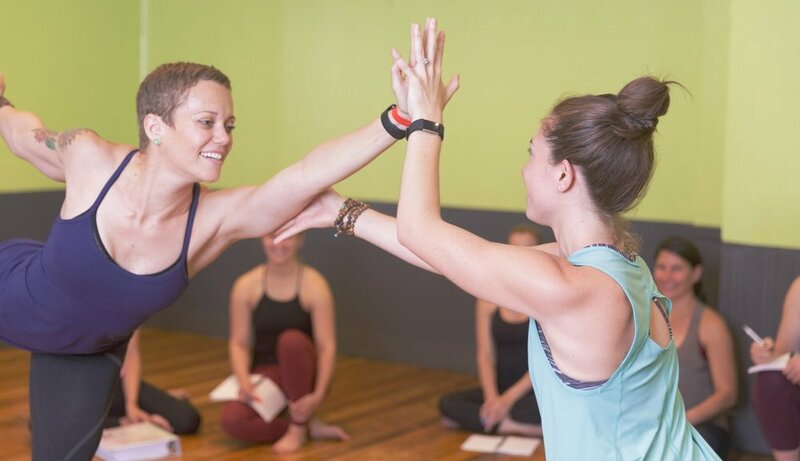 Our training attracts aspiring teachers and dedicated students from numerous yoga communities which creates an incredible family of energy, support, and learning. Tension, compression, proportion, and orientation in asanas. Sequencing methodology of vinyasa yoga - the why and the what of the practice. Teaching all-levels and beginners yoga classes. Creating powerful programs: Workshops, events, and specialty classes. Statistics of the profession, history, trends, and where it's going. Finances and important conversations for getting hired. Techniques and strategy for sustainable teaching. Our program is led by Lead Teachers Lindsay Lusignea and Kate Manchester with specialty workshops by Guest Teaching Faculty. Hours during your Summer 2019 YTT will be held at both of our locations at Merritt Clubs and Sanctuary Bodyworks. The locations are just one mile apart and each offer beautiful facilities and locations. Both Merritt Clubs in Canton and Sanctuary Bodyworks in Fells point are situated in the heart of their neighborhoods with cafes, restaurants, grocery stores, convenience stores, safe parks during your breaks, and refreshing views of the water. Please refer to our locations page for more information about each location and see below in the Program Format + Dates section to understand which training hours will be at which location. The following are required in-person hours for the Summer 2019 YTT program and include lecture-based learning, interactive discussions, hands-on experiential learning, practice teaching, and yoga practices. Led by Lindsay Lusignea and Kate Manchester, the 6 weekends required for this training are spread out across four months. The four Practicum Sessions throughout the training are led by the training faculty focusing on application of the curriculum within group teaching practicums. Additional hours include Audio Lectures, homework assignments, reading assignments, journaling, peer teaching, a midterm, and a final project. These hours are completed around your own schedule. Graduates report an average of two-three hours of additional work per week to complete these assignments. What also makes our trainings so appealing is you are free to maintain your yoga practice anywhere you would like - we ask you practice anywhere you would like three times per week in classes taught by anyone. What does your tuition include? All weekend and study session training hours led the Lead Teacher, training and workshops led by Guest Faculty, access to our premiere online Student Portal system, Audio Lectures, 280-page Teacher Training manual, 30% off private yoga sessions, 50% off workshops/webinars/Teaching Mentorship, and 50% off classes taught by your lead teacher, Lindsay, at Sanctuary Bodyworks. These discounted benefits are during your YTT course and for the three months following. Tuition also includes life-time access to our always growing Online Student Portal and our thriving Alumni Association community upon graduation. Additional fees: Four books required for training, announced upon program acceptance. These books total under $75 for all four, and this reading list will be sent to you upon acceptance. Are you a Merritt Clubs member? Get 10% off your total tuition. That is at least a $270 savings! Register today - you will be asked to indicate if you are a Merritt Clubs member - and we'll deduct this percentage off your tuition balance. Payment plans: We know how valuable this program is and want YOU to be part of it. We also know Yoga Teacher Training is a financial commitment. We want to help. Four month payment plans are available upon request. Requests can be made once we contact you about tuition payment after your application has been submitted. COMPLETE THE REGISTRATION FORM. Click here or on the button above to complete and submit the online registration form. RECEIVE YOUR REGISTRATION LETTER. Once you register, you will hear from us by e-mail regarding your enrollment to the program, including the books list and details to get started on your yoga teacher training journey. COMPLETE TUITION PAYMENT. Along with this above letter, we will send you options to begin paying your tuition balance - your choice of a $500 deposit to begin your payment plan or your full tuition upfront. Interested in the program and would like to learn more? Not sure if you are "ready" to begin? Do you have a schedule conflict during this upcoming training? Wondering what the average time commitment is outside of training hours? You're not alone! We have compiled the most frequently asked questions that multiple people ask us multiple times a year. Our Teacher Training is nationally recognized and registered with the Yoga Alliance. Upon completion of this program, you can receive your national registration with the Yoga Alliance as a 200 hour Registered Yoga Teacher (200RYT). Learn more about the Yoga Alliance by visiting their website. Do you have questions or dates to discuss about the 200 hour Teacher Training course? Are you interested to register, and would like to meet us first in-person or via a phone call? Fill out the form below and we'll get back to you within two days.